There was a genuine air of excitement when the Asus Automobili Lamborghini VX7 rolled into the office. A Lamborghini Gallardo boasts a 552bhp V10 engine and its namesake is running the laptop equivalent – an Intel Core i7-2630QM CPU, Nvidia GeForce GTX 460QM GPU and 8GB of RAM. The lid is sculpted to resemble the front of a Lamborghini, complete with the famous badge on the front. The base of the laptop protrudes out behind the screen hinge and sports mock Lamborghini rear lights and two gigantic vents. Although our review unit was black, this laptop is also available in a striking orange finish that we think looks even better. 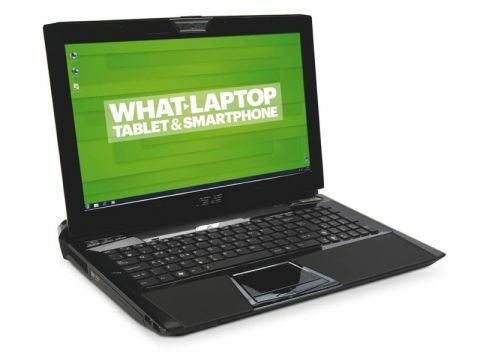 The inside of the laptop is also designed to mimic its four-wheel counterpart with a black and chrome finish – and the power button even reads 'start engine'. Better yet, the palmrests either side of the matt-black touchpad are stitched leather, just like the upholstery of a proper super-car. Not everyone will be a fan of the chunky design and, if you like your laptops slim and svelte, this isn't the machine for you. The design also means that it's incredibly heavy at 3.9kg and even if you wanted to carry it round, the dimensions make it hard to fit comfortably into a bag. Even though you're consigned to a desk, usability is fantastic. The 15.6-inch Super-TFT screen is bright and it runs at a native pixel resolution of 1920 x 1080, so even the most complex websites and dense pictures are rendered in extremely sharp detail. Aside from looking the part, the two large vents at the rear of the VX7 keep it cool during prolonged gaming sessions and we had no problems with excessive heat during our tests. If you want to up your usage from pictures and web browsing to editing video and playing games, then the Asus really comes into its own. The Nvidia GeForce GTX 460QM is one of Nvidia's top GPUs and when we tested Need for Speed: Shift and Tom Clancy's HAWX, each on the highest detail settings, the VX7 showed no signs of lag. The VX7 also boasts a Blu-ray drive and dual 750GB hard drives, adding up to well over a terabyte of storage space. Asus is keen to label the VX7 as a high-performance laptop rather than simply a gamer's machine, and both the usability and range of features reflect this. The isolation-style keyboard is very comfortable to use and backlit for when you end up working late. The VX7 also features four USB ports for transferring data and documents, one of which uses USB 3.0 technology for twice the speed. Elsewhere, HDMI and VGA-Out ports let you connect to another monitor for presentations or even an HDTV. As is always the case with high-performance machines, the battery life suffers badly. The VX7 managed only 119 minutes on battery, giving enough time for one high-definition (HD) movie. This fact, as well as the aforementioned weight and dimensions, means you won't be taking this away from the mains for any great length of time. Understandably, cost is a factor and, although it's not quite the £160,000 needed for a real Lamborghini, the asking price of the VX7 is pretty steep. But if you can afford it, this is a fantastically designed piece of kit that will easily satisfy all your computing needs.